Nitrogen gas is used for a wide range of industrial applications, from precision laser cutting, welding and eye surgery, to modified atmosphere packaging for perishable food products. However, while nitrogen is all around us, making up 78% of the air we breathe, obtaining a ready supply of the gas can be problematic and expensive. Parker offers an ideal solution to this requirement with a comprehensive range of cost effective nitrogen gas generation systems that enable users to produce their total demand for nitrogen gas on their premises, under their complete control. The global manufacturing environment is uncompromising, and to remain at the forefront, suppliers need to meet a multitude of demands – Shortest lead time, highest accuracy, zero rejects, environmentally friendly, with minimum risk, maximum up time and lowest cost. 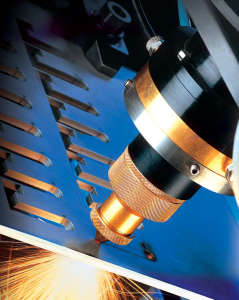 Laser applications are no exception and as the technology evolves and develops to produce more powerful, faster and efficient machines, keeping costs under control to ensure they are financially viable is a constant challenge. “Consumables” such as nitrogen assist and purge gas are a major source of cost and down time within laser technology cutting equipment. Whilst adding to the bottom line of the manufacturer, their costs are often difficult to fully recoup from the customer. In many cases, nitrogen from traditional liquid and cylinder supply methods, can account for over 60% of the total laser running costs. In an extremely competitive marketplace, reducing these gas costs can ensure a significant advantage. Nitrogen is a clean, dry, inert gas primarily used for displacing oxygen from products and / or processes and is used in a wide range of laser applications. By far the most common application for Parker nitrogen gas generators within the laser industry is for use in conjunction with CO2 or fibre laser cutting machines. Nitrogen gas is used as an ‘assist gas’ to blanket the material being processed, preventing oxidisation or discolouration, and to blow away the molten material from the cut edge. Nitrogen is also used in certain types of laser cutting machines as a ‘purge gas’ to ensure the laser beam guide path from the resonator (where the beam is generated), to the cutting head, is free from contamination that could otherwise affect the power or alter the shape of the beam. Depending upon the laser power and the thickness and type of material to be cut, Parker can provide the right solution in terms of nitrogen gas pressure, purity and flow to ensure optimum cost benefits and efficiency for the customer. 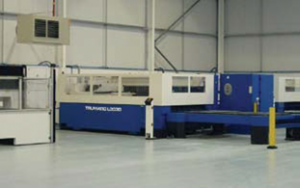 Typical material thickness to be laser cut can vary from fractions of a millimetre to over 25 mm thick (with required nitrogen pressures of up to 28 barg and flow rates to over 100m3/hr).